Leasehold New Houses - Is There No End To Housebuilder Greed? Whilst almost identical in every way, there is one significant key difference. 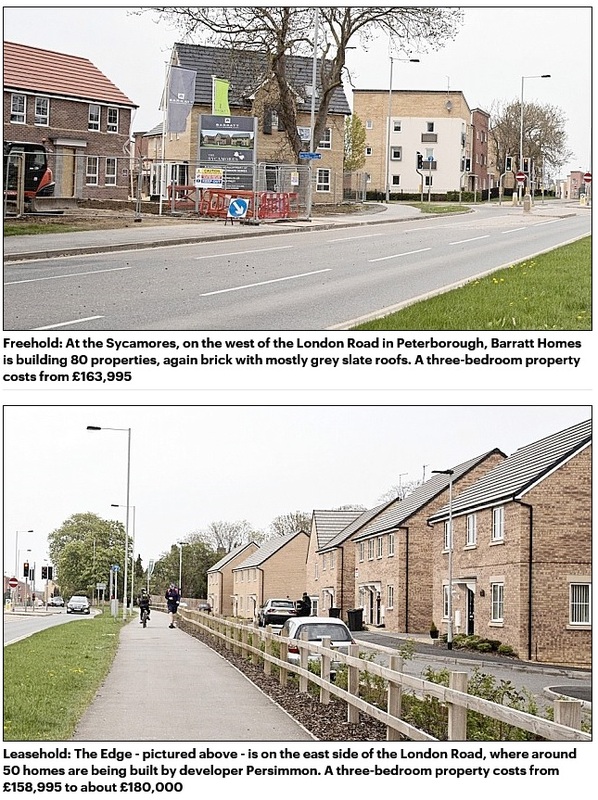 The Barratt houses are Freehold but the Persimmon houses were sold Leasehold, meaning that instead of owning their homes outright, these Persimmon new homebuyers have to pay an annual £150 fee in ground rent for the land the property stands on. Even worse if they decide they wanted to add a conservatory or undertake any major renovations, they will have to ask the freeholder for permission. As the government push for more homes to be built, thousands are being sold as leasehold by housebuilders, many of these inevitably targeted at naïve first-time buyers, unaware of the additional cost and the huge disadvantages that come with owning a leasehold property. It would appear that investment companies are fuelling the rise in leasehold new houses, many seeing it as a way to profit from the annual fees new homebuyers are forced to pay. Figures from the Land Registry reports show that leasehold properties accounted for 43% of all new home registrations in 2015, nearly double the 22% recorded in 1996. Buyers pay an annual fee to the freehold owner — usually the property developer or services firm for the management and upkeep of these shared spaces and services. However, another sting in the tail is, with every year that passes, the property will erode in value as the length of the lease reduces. So why have housebuilders and developers started to sell individual family houses on a leasehold tenure? These leasehold arrangements appear to be principally designed as a means of extracting further and ongoing payments out of their unsuspecting customers. Whether they serve any legitimate purposes is anyone’s guess but I believe it is unlikely they do, or that those purposes could not be met in some other way that does not fix customers with ongoing charges. I am of the opinion that large housebuilders see leasehold tenure as an opportunity to profit twice from the land; once from new homebuyers, who pay freehold prices for leasehold houses and again from either the ongoing charges and ground rent, or from the freehold investment or insurance company, if and when they decide to sell the freehold. I can see no justification for selling a leasehold brand new house. Some unsuspecting new homebuyers will probably not even realise, until they get a bill from a management company, exactly what tenure they have bought. This is even more likely if the buyer use the housebuilders ‘suggested’ or ‘preferred’ solicitor, something new homebuyers should never do as it raises the question of their impartiality and is a conflict of interest. With leasehold, in most cases the freeholder appoints a service company to collect ground rents, service charges and manage the land on which the houses are built. Whilst some of these companies are reputable, others might use residents as a cash machine, with ever increasing charges for insurance and maintenance. The freeholds of large flat developments are commonly sold to one of a very small number of very large companies that buy up tens or hundreds of thousands of these freeholds. Some are unscrupulous service companies who have a track record of making it difficult for leaseholders to their pay ground rents, by not cashing cheques etc. and then claim very large fees and expenses for taking contrived enforcement action against leaseholders for non-payment. “There have been examples where ground rents of £150 per year are due, cheques go un-cashed, and then enforcement fees and expenses of many hundreds, sometimes thousands, of pounds are levied against the leaseholder. Legal action often follows because the leaseholder duly finds it incredibly difficult to get a response to any correspondence or queries from the companies in question, which then launch legal action on the premise that the debt remains outstanding. Naturally, further fees and costs are claimed through the court proceedings. Aggressive lawyers then pursue settlement of the contrived debts and many leaseholders feel compelled to pay large sums to settle those debts to avoid the time and hassle of going to court for what, by then, would be a hollow victory for them given the wasted time and stress they would suffer and the costs they might incur instructing lawyers to represent them. In a worst case scenario, freeholders have the power to force forfeiture of a lease where the entire asset is seized and the leaseholder evicted from their home for failure to pay sums owed to the freeholder. This case, which was ruled the leaseholder’s favour eventually, concerned non payment of the Freeholder’s £76,086.20, legal costs. with the leaseholder having paid off the original disputed £7,548 service charges years ago. According to Savills, investors have poured around £1.2 billion into residential properties with ground rents. At a time of ultra-low interest rates, ground rents are viewed as a steady stream of income. The investment company can also choose to resell the freehold to another buyer. Under the Leasehold Reform Act, leaseholders have a right to buy the freehold at a later date. How much it will cost depends on the value of the home, the ground rent and the years remaining on the lease. It can cost several thousands of pounds. In the meantime, if a leaseholder wanted to make changes to their house such as adding a conservatory — they must seek permission from the freehold owner of the land. As the remaining lease reduces each year, the property loses value. But extending a lease is not cheap either! For example, it could cost around £4,167 to buy the freehold of a £250,000 house, with a ground rent of £250 a year and 995 years left on the lease, according to figures from Freeholdcalculator.com Legal fees could add another £3,000. It gets even more expensive as the lease reaches 80 years. For a £300,000 property, it could cost £10,000-£12,000 to extend a lease with 80 years left compared to around £5,000-£8,000 with 89 years unexpired. As reported in another story Daily Mail reporter Ruth Lythe, told how families in Cramlington, Northumberland, cannot now sell their houses as their leases are about to fall below 80 years. When owners asking to extend their leases they are being quoted £8,000 to £14,000 by management companies. “only around a third of the houses it built over the past three years are leasehold, with ground rent reviewed every year.” Only? Out of a total of 39,609 new homes built by Persimmon in 2013-2015, (assuming 10% were flats, as in 2015) this equates to 11,883 new houses sold by Persimmon as leasehold since 2012 – 3,960 a year. 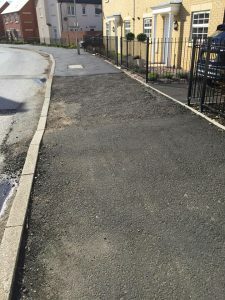 This entry was posted in New Homes and tagged conveyancing, house builders, leasehold, persimmon. Bookmark the permalink.